Want to make real Gym progress? When training for strength, performance or muscle mass your muscles need new challenges to grow. Accept the challenge! Get a complete training with these premium barbell grips and you`ll feel the difference. PZ Sports Grips 2.0 are especially designed to increase the thickness of standard bars and fits easily and quickly your dumbbells, barbells and pull-up bars giving you the ultimate experience while training your muscles and strength. Fat bar training will get your pull ups, pressing movements to a whole new level of difficulty. Train like a Pro! Grip is one of the most underrated forms of strength training. By incorporating fat grips for weightlifting in your training, you stand a chance of improving your grip strength. For starters, it helps to increase your arm size. Ever wanted to have beefy arms like champion bodybuilders? Well, if you have always aspired to build your arm size, then fat grip training is the answer. Aside from that, it can help to build your strength. It helps to improve your forearm and hand strength. In addition, it leaves your joints feeling better. If you had tendinitis and pain in the elbow, say goodbye to it. Aside from that, it activates the muscles around the shoulders, elbows and wrists. As a result, it strengthens these vulnerable areas against injury. Fat grips for weightlifting are the perfect tools for enhancing your workout. Not only can they supercharge your forearms, biceps and triceps but they can bulletproof your muscles against injuries. In addition, they can help you alleviate muscle imbalances and improve concentration when working out. The best news about fat grips is that they are compatible with a vast majority of bars at the gym. As a result, you can perform a wide variety of workouts from deadlift to chin ups, pull downs and incline bench press among others. CHALLENGE YOURSELF. It`s time to choose only THE BEST for you. No need for extra sets or more money, just put PZ-Sports dumbbell fat grips on your training bars and this will increase the thickness of standard Olympic bar at a fraction of price. You will improve forearm and hand strength. These fat workout grips act like thick bar adapter and help you develop levels of muscle and strength that cannot be duplicated with standard equipment. Augment your workout with these fitness fat grips. TRAIN LIKE A PRO. The ultimate muscle builder. More than some accessories with a 2 inch outside diameter, 4-5/8 inches long and an inside diameter of 1 inch, PZSports thick bar grips will perfectly wrap around your weight bar transforming it in the perfect thick bar. By increasing the diameter you will increase your muscle activation and forearm strength. The best fighters,CrossFit athletes and power-lifters use fat rubber grips in their trainings to build stronger forearms, biceps and triceps. HIGH END QUALITY MATERIAL AND DESIGN YOU CAN TRUST! Premium PZ Grips 2.0 are made of high density military silicone and with it`s perfect ergonomic design can fit most barbells, dumbbell handles, weight bars, ez curl bar, pulldown ropes, pull up bars, push up bars, cable machine attachments and kettlebells. Grip training is one of the most underrated aspects of body building and strength training. The use of thick bar grips forces your forearm flexors and extensors to work evenly. PORTABLE AND COMFORTABLE. With the unique non slip design strategically developed, easy to use and carry PZ Sports dumbbell grips will surely be your workout best friend. You`ll be more powerful and have a stronger deadlift. By incorporating phat grips for Weightlifting in your training, you stand a chance of improving your grip strength. Ever wanted to have beefy arms like champion bodybuilders? If you have always aspired to build your arm size, then bodybuilding fat grips is the answer. A PERFECT TOP-RATED VERSATILE GIFT. 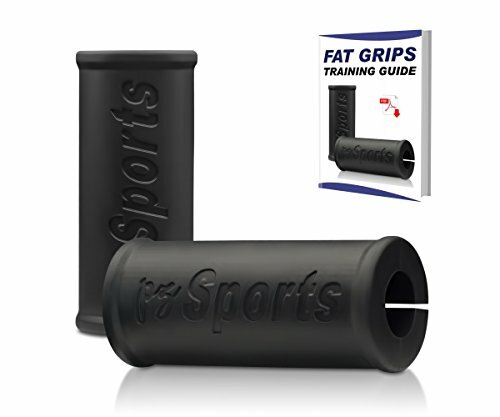 If you are searching for gifts for workout enthusiasts these lifting fat grips are the best choice. Used in any WOD,CrossFit,, Muscle Strength & Body Building Training will transform any standard workout into an extreme muscle building workout. You will experience improved grip together with enhanced joint stability. This means you will now have the power to lift more finally getting stronger. Free access to our E-book GUIDE is included! If you have any questions about this product by PZ SPORTS, contact us by completing and submitting the form below. If you are looking for a specif part number, please include it with your message.